You see, there is a duality with everything in life. There's black and white, big and small, male and female, love and fear and I could go on and on with simple examples but I'm sure you get my point. There's even a duality with how we view God. Some people, who usually follow certain religious practices, view God as a vengeful being who will damn people to hell if they do not follow a certain righteous path. Others, like myself and J. Cole, believe in a more accepting God that loves unconditionally and would never judge any of his/her creation because he/she knows and understands all, even if we, mere mortals, have no idea why a person would do such a horrific action towards another. Granted, there is a lot of gray area in the middle but the majority of people have a tendency to lean towards one extreme or another. 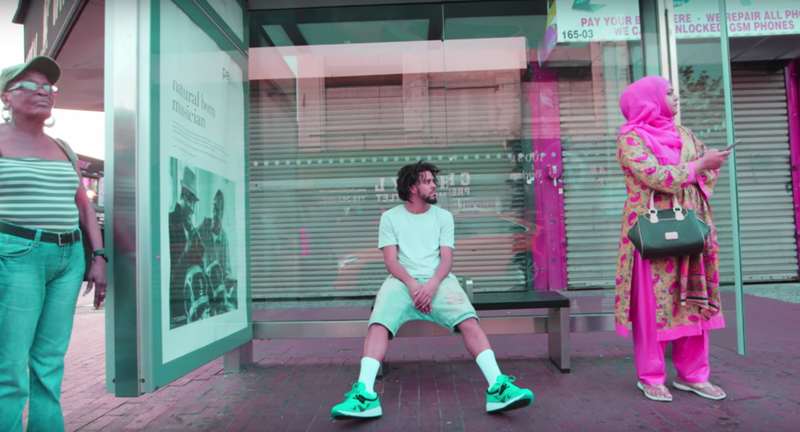 For J. Cole, he leans towards the second view of God, which ironically, is the more controversial belief in our society because it goes against many religious doctrines. In his new Eyez Documentary, that shows the making of his newest LP, Cole shows his strong alignment with this way of thinking, when someone tells him a crazy true story about a young man who, after a major blowup with his family, commits an unfathomable crime. As you can see from the video clip, he truly follows the latter perspective of God, making him able to shift the scope, even in this extreme case, from the murderer being deemed as a "bad kid" to a "good kid" at heart who went down the wrong path due to issues and other major mishaps. In addition, he believes everyone should really view others from this vantage point, no matter their race, which shows great compassion and unconditional love towards humanity. I also wouldn't be surprised, if this empathy stems from witnessing so many men and women who look like him being mistreated and prejudged due to a false narrative of being "bad" when really the narrative should've been about the institutional oppression that happens while being Black. If you think about it, this viewpoint could influence a positive shift in police brutality, the prison system and mental health awareness. However, all of these drastic changes would have to start at the root - the Spirit and that may be the hardest aspect to change, leading us into a never-ending debate that will never get resolved anytime soon. So in the meantime, I'll turn up J. Cole's song and remember that "Life is all about the evolution" and keep being open to the many layers of God, the Universe and what it all means, which leads me to you guys. Let's have a conversation about this. What are your thoughts on this duality with God? Is it possible to see a gray area? And how do you feel about J. Cole and I's stance on it all? Let's talk about it!